4th Annual 91X Presents BeerX June 23 At Waterfront Park In San Diego, Calif. The fourth annual 91X Presents BeerX (Beer • Music • Grub) is set for Saturday, June 23, once again returning to San Diego, CA’s picturesque Waterfront Park. 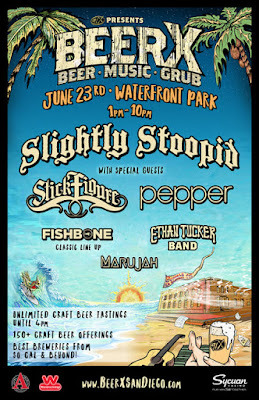 This year’s BeerX brings Slightly Stoopid's “School’s Out For Summer Tour” to their hometown. The 2018 BeerX music lineup features ​Slightly Stoopid, Stick Figure, Pepper, Fishbone (original lineup), Ethan Tucker Band​ and Marujah. BeerX will offer complimentary craft beer tastings for those 21 and up, with an extensive craft beer lineup highlighting some of Southern California’s top breweries, as well as local food selections. Tickets for 91X Presents BeerX go on sale Friday, April 6 at 10:00 AM PT at BeerXSanDiego.com. Note: All tickets for those 21+ include craft beer tasting until 4:00 PM and access to live music. 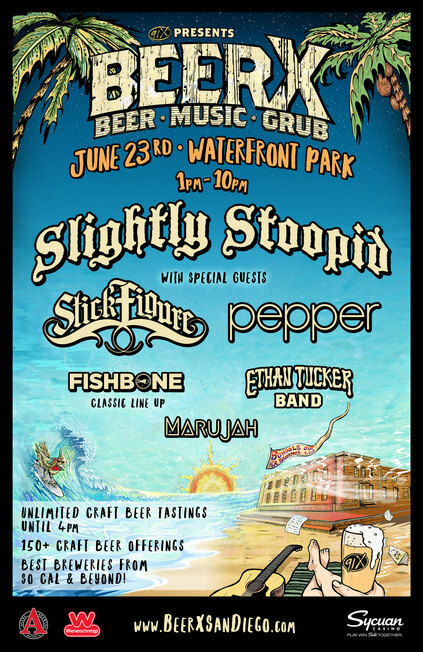 Slightly Stoopid kick off their School’s Out For Summer 2018 Tour (with special guests Stick Figure and Pepper) in June and are excited to headline 91X Presents BeerX. Slightly Stoopid’s Miles Doughty said, "Stoked to be playing 91X's BeerX this year! School’s out for Summer, so bring on the music, good beers and blue skies at Waterfront Park. Hometown hangout, butawatchout." “There's no such thing as a bad beer, just some taste better than others, ha! Can't wait to taste ‘em all and rock with our SD Ohana,” Pepper’s Yesod Williams said. During VIP and early entry tastings (from Noon - 4:00 PM), and general admission tastings (from 1:00 PM - 4:00 PM), 91X Presents BeerX attendees 21+ will have the chance to sample over 100 craft beersfrom some of Southern California's top breweries. Throughout the day and evening, local food trucks and pop-up restaurants will be onsite selling a variety of delicious and unique food options. Craft beer and other libations will be available for purchase at concession stands as well. Last year’s tickets were sold out, with 8,500 in attendance, so patrons are encouraged buy early to save and guarantee a ticket to the show. Also, tune in to 91X for special offers. 91X Presents BeerX is produced by premier music festival production company Synergy Global Entertainment (SGE) and Orange County, California's most successful and respected craft beer festival producer, Brew Ha Ha Productions. BeerX sponsors include Avery, Sycuan, and Wienerschnitzel, with more to be announced. Waterfront Park is located at 1600 Pacific Highway in San Diego, near North San Diego Bay. 91X Presents BeerX will have a convenient drop off area for ride sharing and taxis, and the Green Line to San Diego’s Santa Fe Depot train station is just three blocks from Waterfront Park.